The President of the Swiss Confederation, Doris Leuthard, on Thursday, said that both countries will sign trade agreements and a Memorandum of Understanding ( MoU) on railway infrastructure. 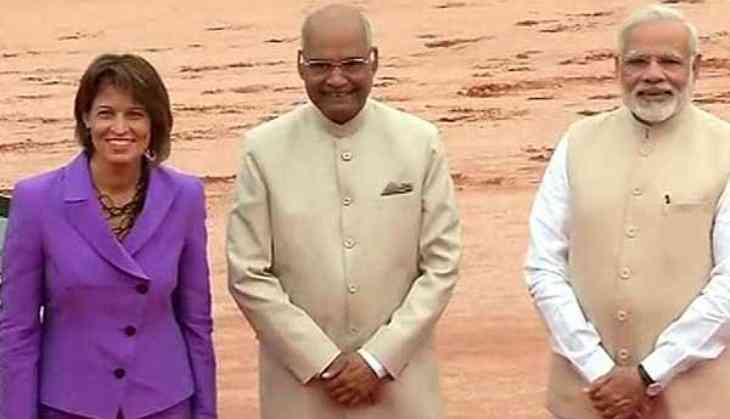 Leuthard said this after she was given a ceremonial reception at the Rashtrapati Bhavan as she arrived in New Delhi on her three-day visit to India. She also said her visit would give a boost to the Indo-Swiss ties as both countries have 70 years of friendship. "This visit will enhance our diversity of cooperation and I hope we can also give the pending negotiations on trade and partnership agreement a new impetus," she said. Leuthard also praised Prime Minister Narendra Modi's reforms. "We are very pleased with Prime Minister Modi's reforms," Leuthard said. Accompanied by a large business delegation, Leuthard is set to hold talks with her Indian counterpart, President Ram Nath Kovind, External Affairs Minister Sushma Swaraj and Vice-President M. Venkaiah Naidu.